Removable "In Ground" Hammock Post. Used when only one tree is available to hang a hammock. Removable 76.5" x 2.5" diameter 11 gauge steel pole/post inserts into a permanently installed steel sleeve flush with the ground surface. The pole is removable for lawn mowing. Available in hunter green powder coated finish only. 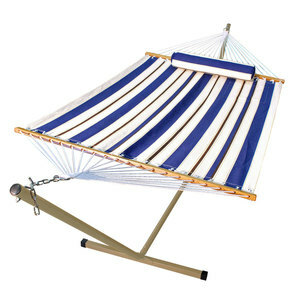 The hammock post is perfect if you only have one tree on which to attach your hammock. It's in-ground design features a removable above ground pole for easy lawn mowing.